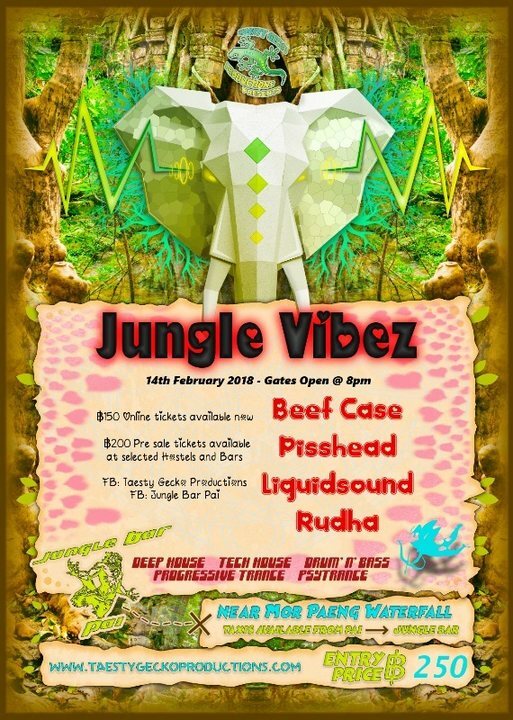 Taesty gecko productions would like to presentJungle Vibez, at the Jungle Bar Pai. We will be raising the VIBEZ at this months event as it is valentines day, so bring your partner and have a boogy or bring yourself and see where the VIBE takes you. Furthermore, there will be fire performances, UV face painting, local food and quality cocktails. We have bungalows and dorms for rent at Jungle Zone available on site. In addition to this if you rent out a room for the night you will get free entry to the event. Throughout the night there will be a taxi service available for ฿50 to and from the party at Duan Den Taxi. (across from AYA bus service). Online pre sale tickets for ฿150. ฿200 Pre sale tickets available soon at selected bars and hostels. or ฿250 on the gate. As this is a Jungle Party we encourage any event goers to dress up in costume, our theme is JUNGLE.